In 1493, Christopher Columbus arrived from Spain on his second voyage to the new world and discovered a deserted Carib village. His crew came upon piles of freshly gathered produce, including a curious new fruit which had an abrasive, segmented exterior like a pine cone and a firm interior pulp like an apple. When Columbus returned to Europe and introduced the pineapple, both fresh fruit and refined sugar were a rare sight. The sweet fruit was instantly revered by the royal court, but farmers were unable to grow the tropical plant in a conflicting climate. With low supply and high demand, pineapples found themselves as a symbol of royal privilege. For years, a whole pineapple on display at a party meant no expense was spared in guaranteeing the guest’s enjoyment. With so much to offer, pineapples are the key to a refreshing dish in restaurants, hotels and catering. Their regal look and iconic taste create endless serving options that add a unique twist to the menu. Born with a crown by nature, pineapples provide multiple uses in the kitchen, from tasty dishes to ornaments. Along with royal history, the pineapple’s stunning shape alone can add an instant regal element to any table. Have fun dressing up place settings with pineapple! Create a fresh and tropical vibe by adding freshly chopped fruit into a hollowed out pineapple. This reduces food waste and makes guests feel like they’re in paradise. Dressing up the table for a more elegant occasion? Trendy metallic pineapples make the perfect candle holder for a romantic-lit dinner. Check out our how-to video below. So much more than a side dish, the food industry can incorporate pineapples into breakfast, lunch, dinner, drinks and dessert recipes. 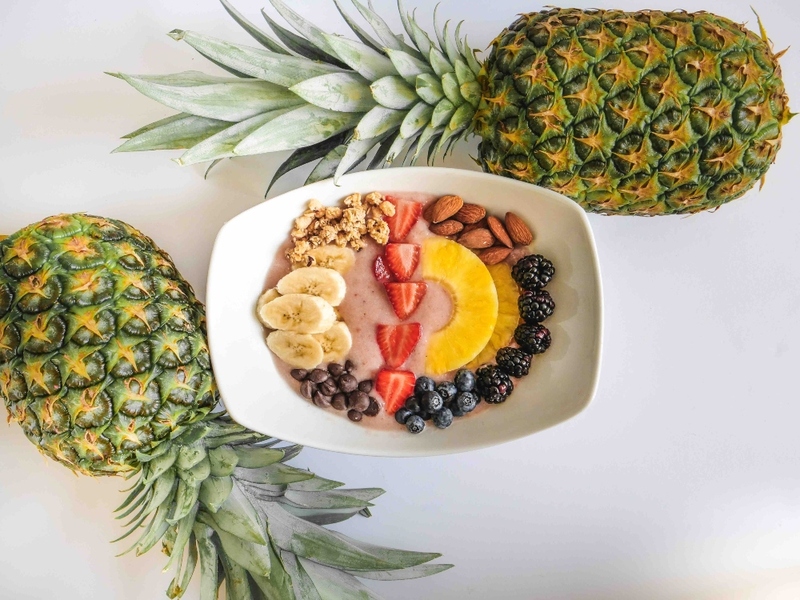 Offer guests the option to start the morning bright and fresh with a pineapple smoothie bowl. For a more indulgent option, add crushed pineapple into pancake batter for a tropical breakfast treat of pineapple pancakes. 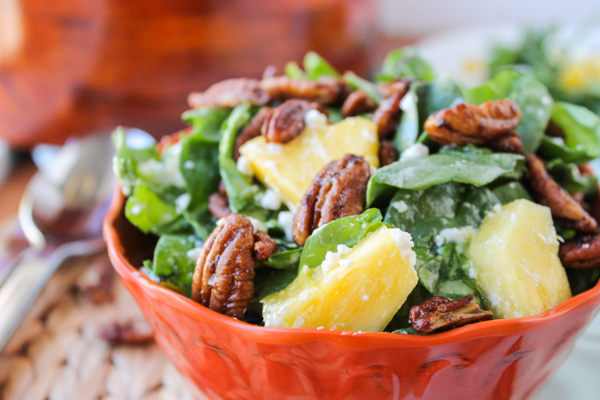 Liven up light salad selections with the addition of pineapple for a healthy and vibrant lunch. On the sweeter side, create a fresh twist on fruit salad by adding in the queen fruit. Internationally, restaurants incorporate our favorite prickly fruit into unique dining options. 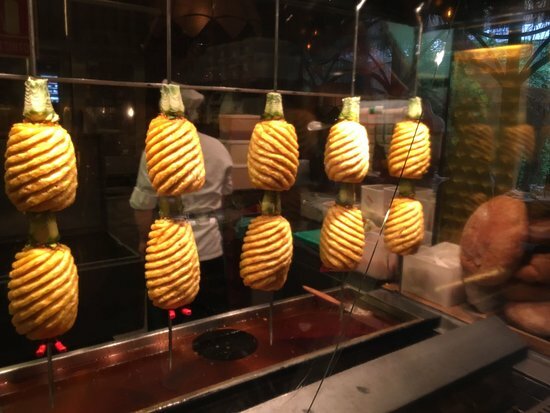 In Madrid, Spain, Restaurante Amazonico features whole pineapples grilling over an open flame. Awarded Trip Advisor’s Certificate of Excellence, they welcome locals and tourists alike to visit and enjoy the atmosphere created around the pineapple grill. A worldwide sensation, pineapple often mingles with other international cuisines, like pineapple fried rice or even pineapple guacamole. Along with a classic pineapple upside down cake, pineapple can make itself right at home when it’s time for dessert. 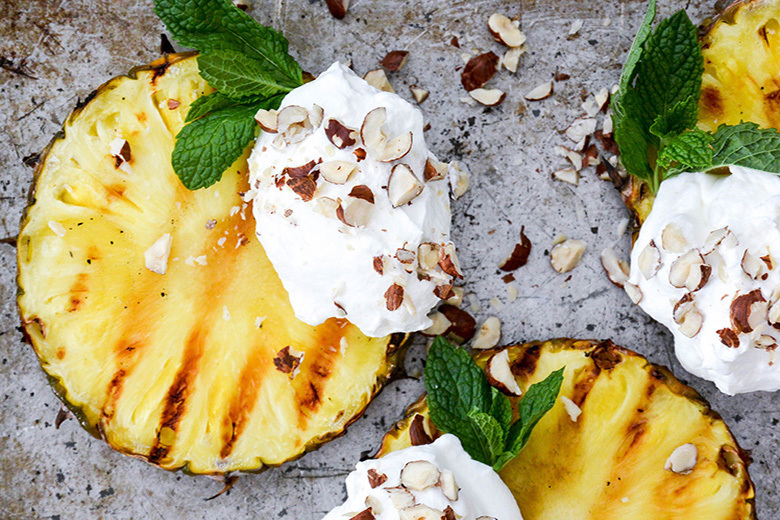 Grilling pineapple transforms the fruit into a sweet and indulgent treat. Sprinkle grilled pineapple with cinnamon sugar or pair it with vanilla ice cream for a unique dessert option. From brunch to after-dinner libations, the fresh citrus of pineapple can brighten up classic cocktails. Pineapple mimosas offer a more tropical take on a brunch classic, and The Perfect Pineapple French 75 presents a fun, yet sophisticated, cocktail option. Check out our Perfect Pineapple Punch recipe for a boozy summer treat to please a crowd. Pineapple, with all its wonderful tropical flavor, also carries immense health benefits. With a considerable amount of calcium, potassium, vitamin C, carbohydrates, fiber and different minerals, serving up a plate of pineapple means a healthy dose of goodness for the body as well. Its exceptional juiciness helps to hydrate and maintain the digestive system. The fruit also contains bromelain, a protein-digesting enzyme that works to break down complex proteins into simpler amino acids. 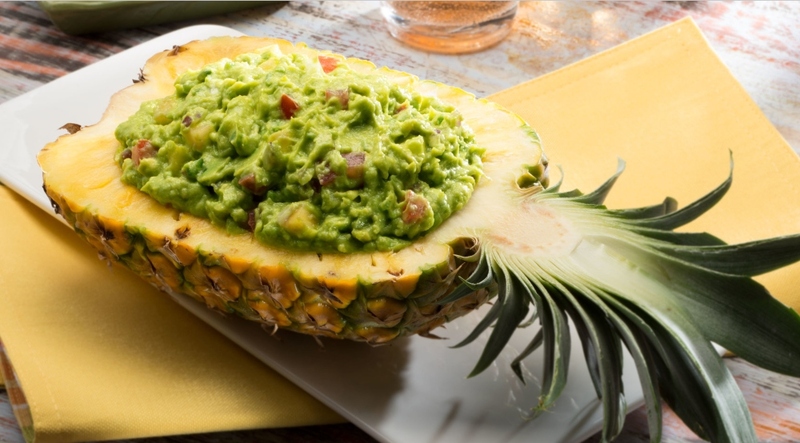 Diners are healthier and happier after consuming pineapple dishes that combat stomach aches! 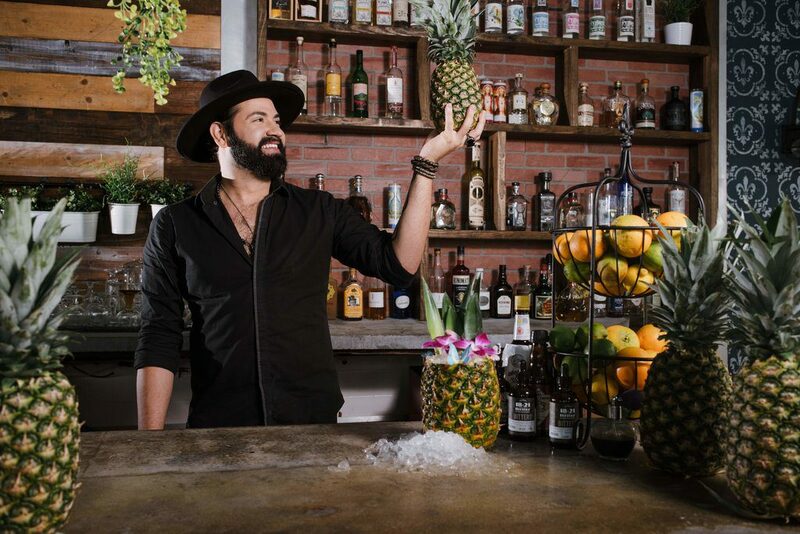 Subscribe to our newsletter to stay in-the-know about pineapple trends in the hospitality industry! This entry was posted in Featured, Latest News, Recipes, Tips & Tall Tales and tagged appetizer, bromelain, dinner, drink recipe, fall pineapple recipes, food industry, food service industry, health benefits, healthy recipes, hospitality, hospitality pineapple, pineapple, pineapple in catering, pineapple in food service, pineapple in restaurants, pineapple recipes, smoothie. Bookmark the permalink.